We have seen family greeting cards from Julius Agwu and Klint da Drunk but here comes the MAVIN Crew supremo himself, Don Jazzy, with his official greeting card. 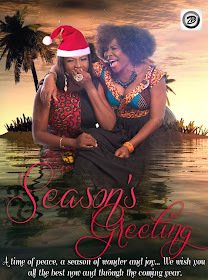 Lest we forget, the inseparable duo of Omawumi and Waje also have theirs out, but it appears we’ve seen this beautiful photo somewhere before? Well, If you have, we’d like to know where. Till then, Merry Christmas people! It's in the Y! Magazine 9.